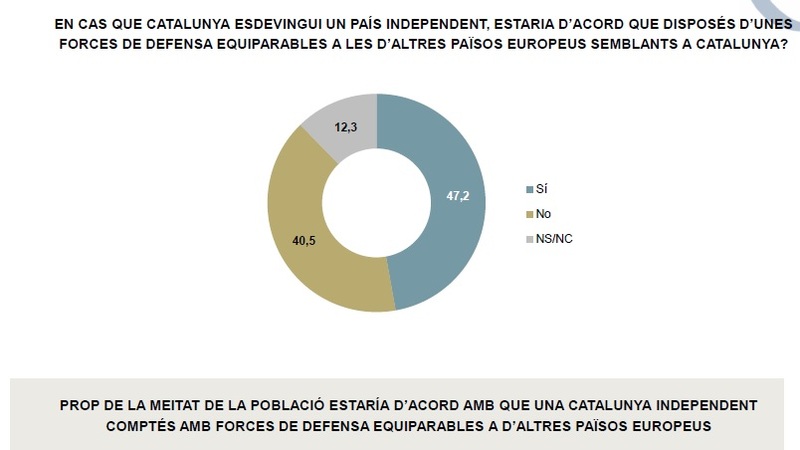 A majority of Catalans want an independent Catalan State to have defence forces, according to a survey commissioned by the Society of Military Studies (SEM). In this regard, 47.2% of respondents want an independent Catalonia to endow itself of defence forces comparable to those of other European countries, while 40.5% are opposed and 12.3 percent of respondents have no opinion or do not response. Regarding the membership of NATO, the figures are even clearer and 53.1% of those surveyed want a Catalan State to be part, while 30.3% are opposite and 16.5 percent do not have Opinion or do not response. Finally, the most conclusive result of the survey refers to the participation of an independent Catalonia in international peace missions in the event that it had defense forces. At this point, 70.9% of respondents are favorable, while 19.0% do not agree and 10.1% do not respond or have no opinion. The survey takes into account several variables, such as the voting record, the location on the ideological axis, the feeling of national belonging, gender, age, nationality, habitual language or level of education. In this sense, the data indicate that the support to have defense forces, to be part of NATO and to participate in international missions is transversal. The SEM appreciates the results of the survey very positively because it shows that Catalonia is a country with a public opinion comparable to the rest of European countries in terms of defense policy. In addition, the SEM also appreciates in a particularly satisfactory way the fact that this support for some defense forces of a Catalan State is even more accentuated among young people, women and people with higher education, which suggests that this support It will increase even more in the future. The survey was conducted between July 3 and 11 on a sample of 1,600 telephone interviews performed throughout Catalonia to people 16 years and older. The margin of error is + -2.5%.